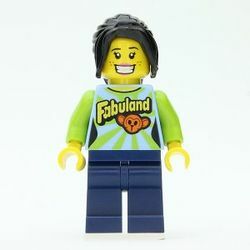 Fabu-Fan is a minifigure released in 2014 as part of the LEGO Movie theme. She is a fan of Fabuland. She wears a T-shirt with the Fabuland logo and the head of a Fabuland monkey. This page was last edited on 14 November 2016, at 17:09.